Greece is located at the most southerly part of the Balkan peninsula and the south east of the Mediterranean sea. From the north Greece borders with Albania FYROM and Bulgaria. From the east it borders with the European part of Turkey. To the west of Greece is the Ionian Sea and to the east is the Aegean Sea. To the south is the Libyan Sea ,see more information about the Geography of Greece about the lakes, rivers and mountains of Greece ,details of the geomorphology of Greece you can find at the Physical map of Greece. The coast line of Greece is 13,676 km therefore having a the longer coastline in the Mediterranean. .Most of the Greek islands and islets situated in the Aegean sea, while a small number of islands are in the Ionian Sea. Greece is divided into 13 regions or peripheries. East and West Macedonia with Thrace in the north and north west ,Epirus in the north west with Thesally and Sterea Ellas with Evia in the centre ,the Peloponesse in the south, the Ionian islands in the west and the Aegean islands (Cyclades ,Dodecanesse) with the north Aegean islands in the east and north east. At the southern tip lies the largest island of Greece Crete see more at the Political map of Grece. Details of the historical cities and areas of Greece you can find at the map of Ancient Greece. Greece in general is not dense inhabited, with a total surface of 132 000 sq.km, Greece has a population of about 11,000,000 inhabitants. 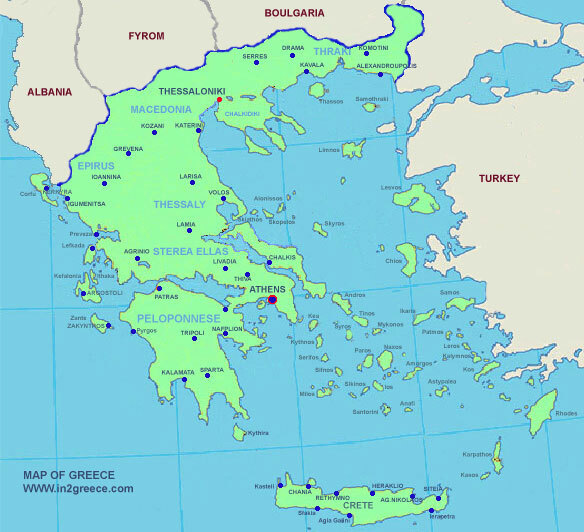 The reason for that is that most of the Greek mainland is mountainous with a few plateaus in Thessaly, Macedonia and Thrace and a large part of the country consists of islands. Therefore most of the population of Greece is concentrated in the big urban centres with Athens and its greater area and Piraeus to have the one third of the Greek population followed by Thessaloniki , Patras, Heraklion and Larissa.